BETTER PRODUCTION Shops Using Technology mmsonline.com December 2016 MMS 121 so complex system coordination is handled by the cell's controls. Installation of the system was completed within projected timelines, and SEW's cell operated at peak performance on its first production run, the company says. 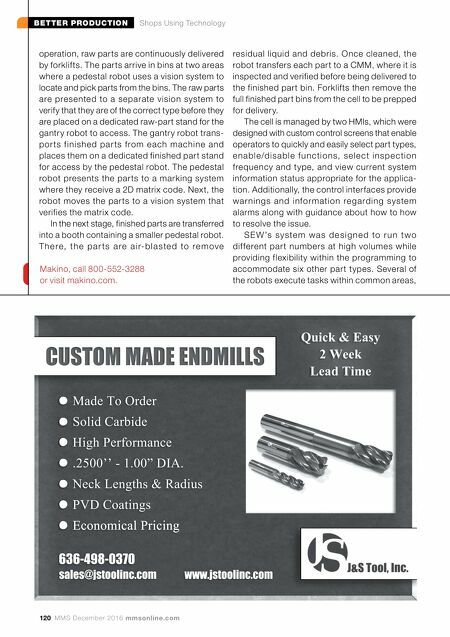 "We trust the reliability of Makino's machines and the processes that their engineers create," says Melvin Stor y, manufacturing engineering technician. "Part qual- i t y is n o n-n e g oti a b l e for us, so repeatability a n d a c c u r a c y a r e e s s e n t i a l . T h e a 8 1 machines consistently m e e t o u r 13 - m i c r o n b o r e to l e r a n c e s a n d maintain repeatability within 20 to 30 microns on location tolerances. As a result, our scrap rate is less than 1 per- c e nt eve r y ye a r, a n d that includes any cast- ing flaws." Operators attended t r a i n i n g a t M a k i n o's headquar ters to help them understand the c e l l c o n t r o l l e r s a n d enable them to manage systems efficiently with a high-degree of con- fidence. "When devel- oping the HMI, our team s t r i ve s fo r s i m p l i c i t y through standardization of menus and messag- ing that makes it easy for operators to quickly i d e n t i f y a n d r e s o l v e issue s. It is all about ba la ncing ae sthetic s a n d f u n c t i o n a l i t y fo r optimum performance," says Paul Woodbur y, p r o j e c t e n g i n e e r i n g team leader at Makino. T h r o u g h i t s m o r e than a decade-long experience with complex automation systems, SEW's Lyman plant pro- duction output has grown tenfold with only a 6 percent increase in manpower since the instal- lation of the first automated cell. This has not only helped the plant to retain skilled labor during tough economic cycles, but it has also led to improved product costs and the potential for greater profitability for years to come. US citizen or permanent resident status is required. EOE/AA Minority/Sexual Orientation/Gender Identity/Female/Disability/Veteran Join us - Global Manufacturing Engineering Mgr. in our Commercial Aircraft Engineering Dept. • Be a part of global aerospace • Enjoy quality of work and life • Beautiful Western New York location We are seeking a Manufacturing Engineering Manager to lead a highly talented team in the production of complex, precision motion-control components. You will be challenged to excel in systemic, continuous improvements to processes, new application development, and enabling communication across a globally dispersed organization. Moog is a collaborative, engaged team of talented professionals dedicated to solving our customer's most diffi cult problems. At Moog, we are pushing the frontiers of new technology in automation capabilities, and metal additive manufacturing using steels, aluminum and titanium. To ensure success in this role, your expertise in LEAN, contemporary processing and machining capabilities will help drive this effort! Headquartered in East Aurora New York, you can expect travel to other Aircraft Manufacturing sites or worldwide in support of customer programs and capital equipment acquisitions. At Moog, you can count on a unique culture that supports our talented people allowing them to approach their work with energy, enthusiasm and the promise of success. 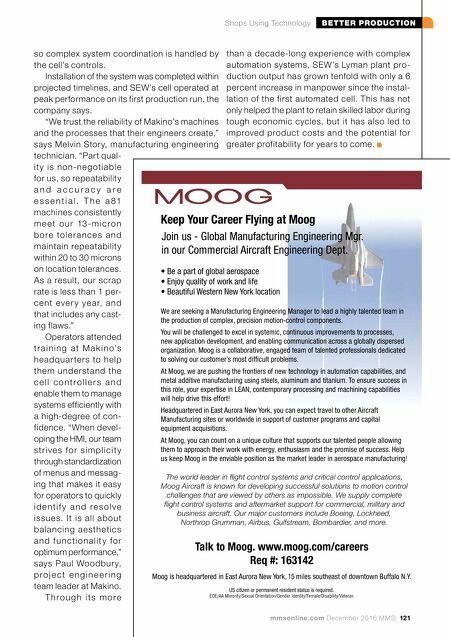 Help us keep Moog in the enviable position as the market leader in aerospace manufacturing! The world leader in fl ight control systems and critical control applications, Moog Aircraft is known for developing successful solutions to motion control challenges that are viewed by others as impossible. We supply complete fl ight control systems and aftermarket support for commercial, military and business aircraft. Our major customers include Boeing, Lockheed, Northrop Grumman, Airbus, Gulfstream, Bombardier, and more. Keep Your Career Flying at Moog Talk to Moog. www.moog.com/careers Req #: 163142 Moog is headquartered in East Aurora New York, 15 miles southeast of downtown Buffalo N.Y.